A Tel Aviv-area zoo treated a male Sumatran tiger with alternative medicine when all else failed, calling in an acupuncture specialist. A Tel Aviv-area zoo decided to treat a 14-year-old male Sumatran tiger with alternative medicine when all else failed, calling in an acupuncture specialist. Pedang, who suffers from chronic ear infections, is a resident at the Ramat Gan Safari, an open air zoo located in the Tel Aviv suburb. Alternative medicine specialist Mor Mosinzon was called in to treat Pedang, according to a report published in The Independent, after two prior treatments carried out under anesthesia had failed. For the first time, the zoo said in a statement, zoo officials decided to try holistic treatment instead. Veterinarians administered the anesthesia, cleaned the big cat’s ears, took samples of his blood and skin and then Mosinzon used his pink acupuncture needles to administer the treatment. 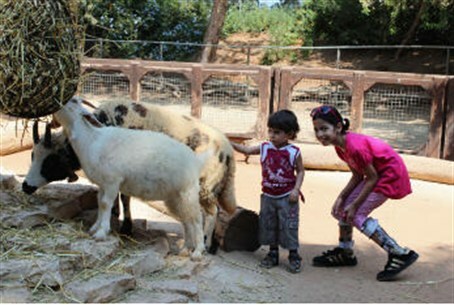 The Zoological Center Tel Aviv - Ramat Gan, or “Safari” as it is better known, occupies 250 acres of nature in the heart of one of the most densely populated areas of Israel. At the Safari, the animals wander freely in large herds as in their natural habitat on the continent of Africa, and visitors to the site arrive as “guests of nature” to learn about their typical behavior and feeding habits. The zoo has the largest animal collection in the Middle East, according to the zoo’s website, and is unique in the world, with 1,600 animals of different species, including 68 species of mammals, 130 species of fowl and 25 species of reptiles. Visitors to the safari area are warned for safety reasons to stick to the designated roads, to keep their windows closed and not to leave their vehicles for any reason whatsoever.